Microsoft Dynamics is an industry leader for business software such as ERP (Enterprise Resource Planning) and CRM (Customer Relationship Management) solutions. Choosing the right software is important, and no doubt you’ve done your homework and discovered the functionality that will help your business automate, organize, and move ahead. But once you have short-listed a Microsoft Dynamics solution, an equally important decision will be choosing a partner to work with. A trusted partner will help you with installation, but they should be able to do much more. The right partner can make sure your project stays on track, on budget, and includes the right parameters to help you meet your business goals. It may seem difficult to choose between various technology partners but doing so is vital to the success of your ERP or CRM project. 1. Do they have expert knowledge of the product? You’ll want your partner to have extensive knowledge of Microsoft products so they will be able to advise you in your selection. They should understand Microsoft’s history and also the direction in which it is headed so they can help you plan for future growth. 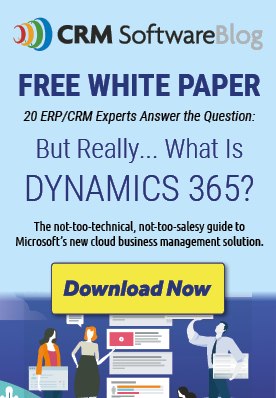 Microsoft Dynamics is an established product. Choose a partner that is familiar with the depths of its reporting capabilities, user interface, and customization options. 2. Do they have experience in your industry? Has your partner worked with other businesses similar to yours? Ask for references and check them out. If your partner has successfully helped others in your business niche, chances are good that they will understand your processes and goals, be familiar with your challenges, and can anticipate your needs. True, every organization is different, but specializing in an industry will have allowed your partner to build a wealth of institutional knowledge that will help them best advise you. 3. Do they have an experienced senior staff and an engaged team? Project implementations will be successful if the partner’s team is both experienced and passionate about the project. Ask your partner who exactly will be working with you and what are their qualifications. How long have team members been with the company and in the industry? 4. Do they have a positive track record for implementations? Ask the Dynamics partners you interview to provide you with some facts and figures that indicate their project success rates in terms that are meaningful to you. Find out what percentage of their projects come in on budget. For projects that incurred additional fees, find out what the circumstances were behind the scope creep. 5. Do they have a responsive support plan? You shouldn’t assume that you will throw a switch on your go-live day and never need help from your partner again. As your organization continues to grow, so will your needs. Perhaps you’ll want new reports or need to add new users. There will eventually be updates and upgrades. And if you need a troubleshooter, it’s nice to know that you can call and get help. Identifying criteria that is important to you and identifying how the partner compares will help you pick a partner that is capable of delivering to your standards. When it comes down to it, hiring the right partner is partially based on who you like best, who you feel comfortable working with, who you trust. Since 2001, BroadPoint has been delivering comprehensive business application solutions to our clients. From day one, our team of passionate, seasoned consultants has been focused on one thing: helping our clients focus on their mission by designing and implementing great technology solutions. Contact our experts at BroadPoint and let us show you how the right technology partner can help your project succeed. Yes, If you choose the wrong partner then you might lose your time and money, so research well before choosing any partner online. I had chosen the best Dynamics CRM partner and attained success in my business.It determines the success of any organization.